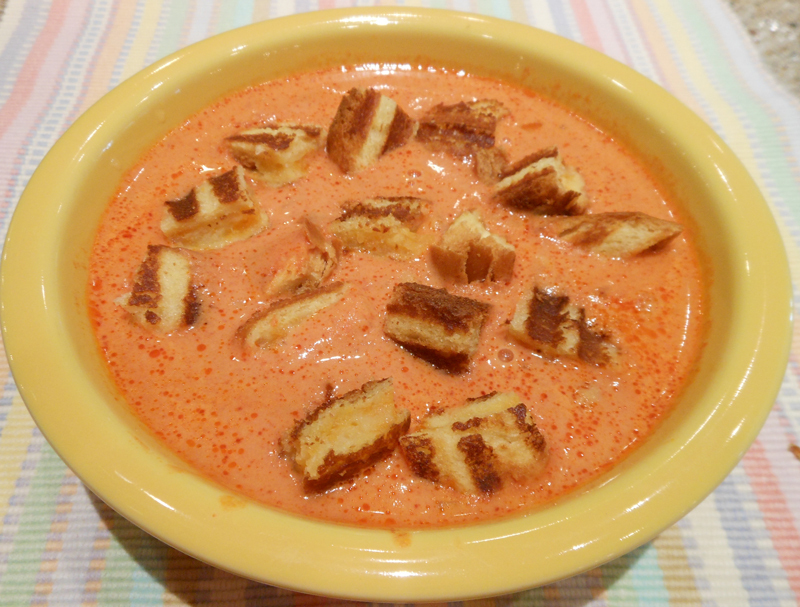 This is the best creamy tomato soup ever. So delicious!! Melt butter in a large pot or Dutch oven. Saute diced onions in butter until translucent. Add tomato juice, diced tomatoes, chicken base, sugar, pinch of salt and pepper, if desired. Bring to a near boil, then turn off heat. Add in cream and stir. Top with grilled cheese croutons. Serve immediately and just see if you’re not in heaven! Heat a panini grill or fry pan. Butter one side each of the 4 slices of bread. Make sandwich with 2 slices of cheese on unbuttered side. Grill until nicely browned. Cut into 1-inch cubes.